Lunch will again be prepared by Russ and a $5 donation is requested. Over thirty people attended last month’s meeting featuring the all day demo by Andi Wolfe. The photos and description are on the Andi Wolfe Demo page. 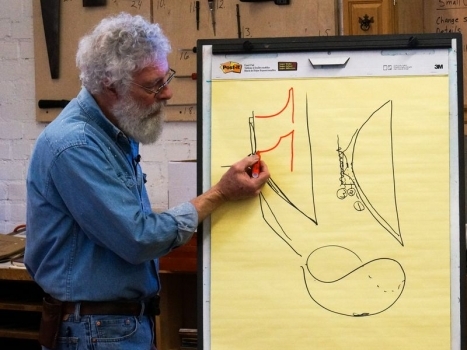 Note that the next meeting is early in the month with a hands-on session at Russ Babbitt’s home. The monthly challenge is Decorated/Mixed Media which is appropriate after Andi’s demonstration. 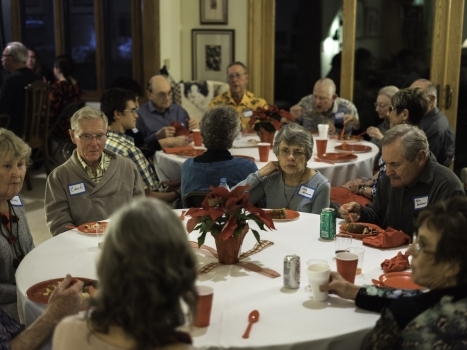 On July 9th is the second Annual Picnic at Jim Rinde’s for Members and spouses. You will be receiving phone calls about this and the potluck. 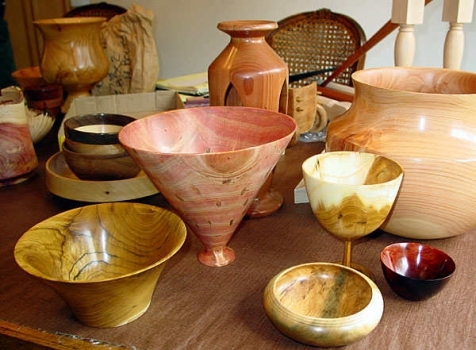 Remember to bring turning pieces you have made to show off to the spouses and each other. Also the next meeting is early in July on the 16th when Kevin Wallace will be discussing issues of design and presentation for gallery work. He will critique any of our pieces we wish him to look at. This is a great chance to prepare for the fair. Several of our members will be attending the AAW Annual Symposium in Kansas on July 22-24. These also are the entry dates for the Ventura County Fair. (see below). Jim Rinde submitted three of his turnings for the juried show at the Kansas City woodturners symposium and had one accepted. His was one of the 39 of 102 submitted entries that were accepted. He calls his “The Wizards Hot Air Balloon”. 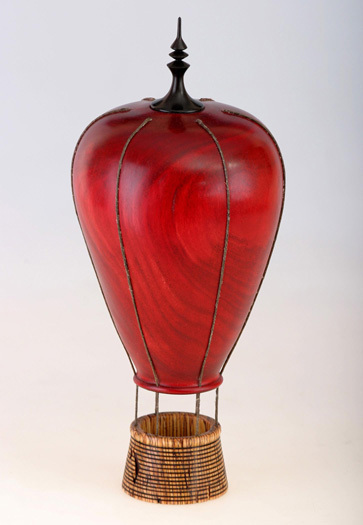 It is Avocado wood dyed red with red shoe dye, ebony finial, parallel wood laminated basket and hemp cords. With an epoxy resin finish. 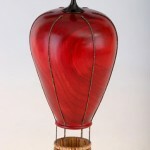 And measures 15 ½ inches high by 6 ½ inches diameter. Sam Turner reports that the Ventura County Fair website has been updated for this year. The changes in the woodturning categories we requested have been included plus they added “Other”. Go to Home Arts Division 341 to see the categories (this requires adobe acrobat reader) and go to Seaside Park and follow the links to find out more about the fair in general. Sam will be signing up club members (remember you also need to be an AAW member) to help with the demonstration rotations at the meeting and the picnic. We will be using our new Vicmarc lathe donated by Mission Produce and will have a new protective viewing shield that will gives us more room to maneuver. The entry date for work is July 22-24, the judging is the 30th and the Fair runs from August 3-14. Sam reports that Dan Hogan has agreed to be the judge for this category again this year.